Two functions in one! 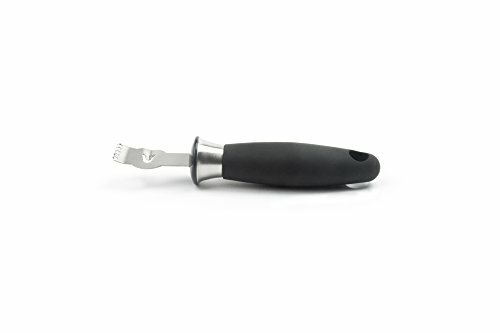 This helpful kitchen gadget includes a convenient channel knife for peeling citrus fruits and features several sharp holes for zesting. Create perfect twist garnishings and strips of zest for cocktails, cooking, and baking. The durable stainless steel head can be put to work easily due to the non-slip Santoprene handle, which provides a comfortable, secure grip. Perfect for lemons, limes and oranges...Garnishing made easy! View More In Fruit & Vegetable Tools. If you have any questions about this product by Fox Run, contact us by completing and submitting the form below. If you are looking for a specif part number, please include it with your message.